Since launching BESSIE’S STORY – Watching the Lights Go Out we have enjoyed book readings at a wide range of venues. Ashley and I feel a little bit like we are the crew on a road tour with Bessie being the featured star. When it’s time to leave for an event she hops in the back seat of our car, lies down and falls asleep. Meanwhile we are loading up books, computers, her leash, cookies (Bessie’s dog cookies and Ashley’s homemade chocolate chip cookies) and all of the paraphernalia required to prepare for any possible chain of events. Bessie’s aplomb in these situations is counterbalanced by Ashley’s anxiety. The nervous mother syndrome, I guess. At the readings there are always a few participants who form a special bond with our girl, and there is no predicting whom she will choose. At the end of a program at a retirement home Bessie had her head in the lap of a ninety-seven-year-old gentleman who had beautiful, sky-blue eyes that twinkled like stars on an August evening with each charming sentence he spoke. Turns out he was going blind. Bess must have sensed this and they formed a bond. He bought a book with the plan that his ninety-three-year old girlfriend would read it to him. He winked at me while sharing this bit of information. A woman in the audience during the reading kept saying, “Yep, yep, that’s exactly how I feel,” while I was reading about Bessie’s adjustment to a changing world. She seemed to vividly understand what Bessie was going through. I can still see her nodding her head during the reading, her connection with Bessie was on a cosmic level. At a reading in the historic Town Hall of a quaint New Hampshire village a sweet, shy, unassuming ten-year-old girl asked me to sign one of Bessie’s postcards. It wasn’t me she was interested in, but Bessie. “Be like Bessie,” I wrote on the card, and her eyes lit up! “I will,” she said. And we both knew exactly what she meant. The card is probably tacked on a bulletin board in her bedroom, or taped to a mirror she sees every day. I hope so. 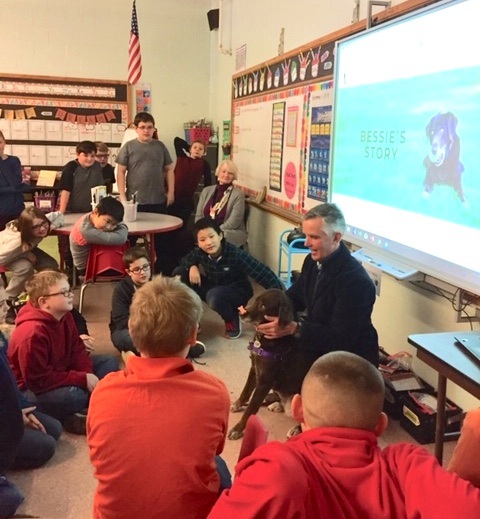 During an assembly at one school I paused after reading the chapter about talking to dogs and asked the kids to speak to each other in their dog voices. Suddenly the classroom was filled with affection and kindness. Bessie’s ears perked up, too. One of the most touching moments came while pointing out to a group of fourth graders how important it is to respond to people with handicaps or disabilities the same way they responded to Bessie―be compassionate, curious and helpful. A nine-year-old described his friendship with a pal who has autism, and how much the relationship blossomed once he understood the condition. Rather than passing judgement, this insightful boy found joy in acceptance. 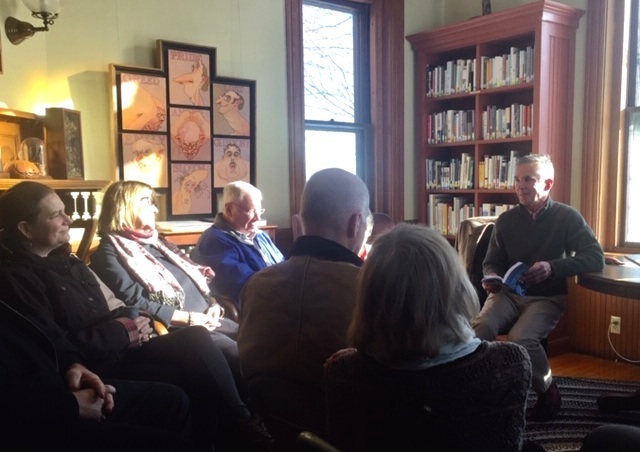 At a reading in a beautiful old library in a tiny New Hampshire town one gruff guy sat in sullen silence with his arms crossed over his chest for most of the session. Then, at the end, he almost broke down in tears describing how much he missed his old dog who had been a companion through some challenging life transitions. I think if we’d okayed it he would have taken Bessie home. She’d have gone with him, too. Dogs bring magic to our lives. They are relatively brief visitors in our busy day-to-day schedules, but their impact is magnified in moments and they skillfully slow us down. Dogs are wonderfully, flatteringly loyal, but at the same time can be uncommonly generous with their affection towards strangers. Bessie has become a conduit for the best that we have to offer each other. A simple message is best: BE LIKE BESSIE! When friends and family gather one of the best measures of their collective love and appreciation is the ease with which the group resumes familiar patterns and interactions. It’s the “pick up where you left off” syndrome and it doesn’t matter if it’s been two weeks or two years, there is instant synergy. Ashley, Bessie and I enjoyed one of these engagements recently when various members of three families shared a small house for two nights. Of course dogs were included. The ages of the people involved ranged from three years old to sixty eight. 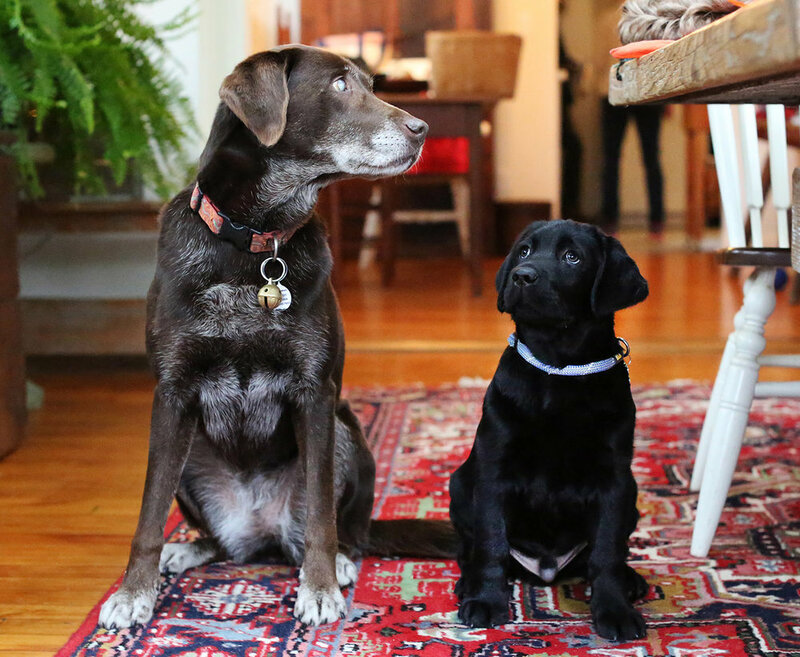 There were grandparents, young parents and young children, along with nine-year-old Bessie and the group’s newest member, Boomer, a ten-week-old black lab who seemed to grow larger by the hour. One interesting observation was the stark contrast between the way the young and older adults interacted with the children when they were misbehaving. It was fascinating, a bit like colliding cultures. Grandparents, the smart ones anyway, have to walk on eggshells in these situations. We had some wonderful laugh sessions that brought us to tears discussing useless parental threats we’ve all thrown out there in moments of frustration, such as “If you don’t stop misbehaving Santa won’t visit our house this year”. Or, “If you don’t calm down and finish your lunch, I’ll put you outside to eat”, delivered when it’s 38 degrees and raining. Among my favorites, one almost all parents have delivered while driving in a car is, “That’s it. Keep fussing and you’ll have to get out and walk home”. Yeah, right, when you’re three miles from the destination? Of course all parents, or at least most normal, loving parents have offered similar, unenforceable ultimatums. It goes with the passionate territory where parents of young children live. Meanwhile, the canine members of this large assortment of characters established clear, easily understood guidelines in the first few hours they were together. When cuddly little Boomer pestered or annoyed Bessie the old girl snarled authoritatively, bared her teeth and the message was clear. “I’m the boss here, got it?” Rather quickly young Boomer, a smart pup, jumped on board and they got along just fine, playing together occasionally and taking side by side naps. Meanwhile, over on the human side of the fence familiar patterns of testing between the kids and adults continued in the most normal, predictable way. There are things my mother did to my brothers and me when we were naughty or fresh in supermarkets, in full view of other shoppers, that would probably get someone arrested today. And my father had no issue offering his brand of discipline, even in the middle of a sandlot baseball game, with dozens of spectators. I should add that I was never in question about my parent’s deep, devoted love for me, not for a moment. And I’m sure my grandparents would refer to them as soft, and my great grandparents would have even stronger comments. On it goes as theories and practices evolve and change depending on the latest research and trends. There will forever be one topic on which all grandparents can agree. I’m referring to the “I certainly wouldn’t have handled it that way” phenomena. This of course is in response to attempts by the younger parents to keep their children in line while trying to impart important life lessons. As I think back to the dogs in my life, beginning with a cocker spaniel named Zippy when I was three and continuing all the way through Bessie, the old and the young established the rules of engagement exactly the same way Bessie and Boomer have. Smart animals, these canines. Perhaps we humans will get it right someday. In the meantime, behave or your stocking will be filled with coal.